Anastasiya gave a brief interview regarding our publication Circling the Square to the Ukrainian newspaper “Day” while in Kiev. The text has been roughly translated into English. Cicada, like Zelig, will be appearing throughout the world this September. First engagement, the Floating Library is afloat! and hosting a number of Cicada rags, along with friends from Ugly Duckling Presse, Interference Archive, Franklin Furnace, the Luncheonette and SeaChange. It can be found aboard the Lilac steamship on Pier 25 in downtown Manhattan. Also, duo Colleen Asper and Marika Kandelaki will be performing Medea as a part of their long running Hole series on September 26th. Check out the Floating Library’s schedule here. Second, we will be participating in the Brooklyn Book Festival this week on Sunday, September 21st. The festival will be running from 10-6 at Brooklyn Borough Hall, rain or shine. All of our current publications will be available, along with artists’ editions and other printed work. There are a huger number of authors and artists speaking as part of the festival’s events, including a PEN panel on writing and surveillance that is apropos our most recent publication on Ukraine’s Maidan uprising, and an appearance by New Weird’s Jeff VanderMeer. And, most dear to us, Anastasiya is in Ukraine at the peak of the current crisis, as both a foreign agent and a native provocateur in the reigning climate of war and ultra-nationalism. She’ll be waving the blackened Cicada banner tomorrow at a new space in Kiev intended as a site for the collective HUDRADA. Nastiya will be speaking on “Circling the Square: Maidan and Cultural Insurgency in Ukraine,” discussing the current process of museumification of protest and the role of cultural institutions in shaping critical consciousness in the face of war and propaganda. She will be joined by a number of contributors to the publication. September 17th, 6:30 PM, 34 Khreshchatyk. 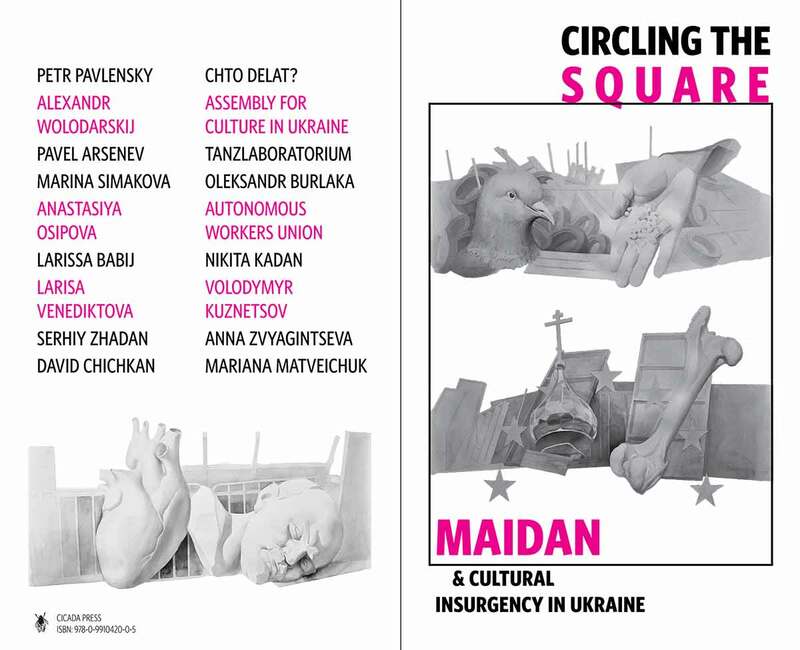 Circling the Square: Maidan and Cultural Insurgency in Ukraine is at the printers at last, clocking in at 40 pages in tabloid format, in English, Russian and Ukrainian. The print edition will be available through the website late this week on a pay what you will basis. We only ask that you cover the cost of shipping. If you’d like to pick up a copy in person, we’re hosting a release at the Interference Archive, June 26th, Thursday, at 7 P.M. with Olga Kopenkina, an NYC based curator who recently traveled to Ukraine and organized the Imaginary Archive exhibition in Kyiv, and Ian Dreiblatt, poet and one of the translators of the publication. We have placed a complete digital edition of Circling the Square: Maidan & Cultural Insurgency in Ukraine up for order in our online store. These will be “sold” on a donation basis, on the “pay what you will” principle. It is our desire to distribute this publication openly and widely with no cover price as a gesture of solidarity. All donations will be used exclusively to offset the high cost of printing, and to facilitate wider distribution of the complete printed edition as well as to ensure that Circling the Square remains in its beautiful full color format. While we are waiting for printer approval and turn around this also allows us to begin to proliferate the articles and calls to action that we feel have a sense of urgency and should not have to wait for lengthy printing and shipping. To donate and receive the digital edition follow the order link, type in your selected price and click “Add to cart”. Follow the checkout on the upper right hand corner of the menu. Be sure to enter an accurate e-mail address in checkout, the download link will be automatically mailed to this address. Payment can be received not only through a PayPal account, but from any debit or credit card. We’ve finished compiling and laying out the totality of our latest publication, Circling the Square: Maidan & Cultural Insurgency in Ukraine. Advance PDFs are available for review, as well as for any interested readers while we await the finalized print edition. A free PDF will be made available after the release event. It’s ultimate form will be a full color 14” x 22.75” newspaper with broadsheet style entries, intended to be distributed at little or no cost. The publication features a massive list of contributors, the majority in original English translation, as well as a complete Russian and Ukrainian index of source material. 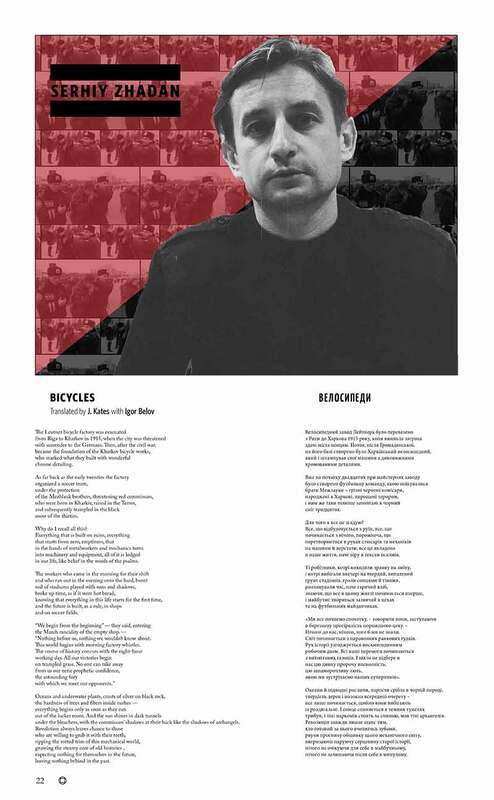 Its contributors: Pavel Arsenev, Assembly for Culture in Ukraine, Larissa Babij, Oleksandr Burlaka, David Chichkan, Chto Delat?, Nikita Kadan, Volodymir Kuznetsov, Mariana Matveichuk, Dmitry Mrachnik of the Autonomous Workers Union, Anastasiya Osipova, Petr Pavlensky, Marina Simakova, TanzLaboratorium Performance Group, Anna Zvyagintseva, Larisa Venediktova, Alexander Wolodarskiy, Serhiy Zhadan. (For a full list featuring bios and links consult our original announcement here). Its translators: Olivia Crough, Ian Dreiblatt, Ilya Kliger, J. Kates, Ronald Meyer, Dennis Ossipov-Grodsky, Anastasiya Osipova. Expect to see the publication back from the presses within a weeks’ time. For further information consult the Titles section. 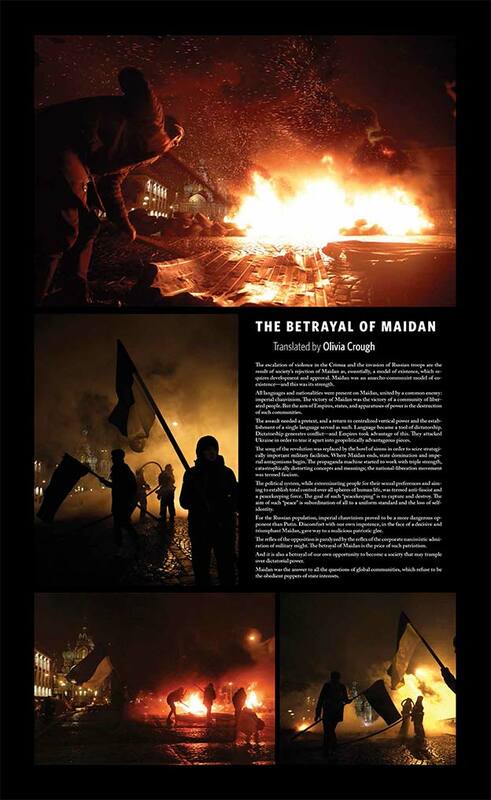 Our newsprint/broadsheet publication dedicated to the recent events on Maidan and the culture surrounding it, tentatively titled “Circling the Squares,” is nearing the final layout phase. The printing has been delayed, but for the best of reasons: we have received and are finishing translating several new and beautiful pieces. The original post has been altered to reflect the new contributors, along with links of interest, but we would like to thank and include them here. The translators who volunteered their help and hours of time to this publication deserve a special mention as well. Additional contributors: Anna Zvyagintseva, Nikita Kadan, Larisa Venediktova, Larissa Babij, TanzLaboratorium, and Mariana Matveichuk. Translators: Ian Dreiblatt, Ronald Meyer, Ilya Kliger, Olivia Crough, Dennis Ossipov-Grodsky, and J. Kates. We expect to send the publication to the printers, with a short turnaround, in about one week’s time. A fitting mural for the times, “Koliyivshchyna” by Ukrainian artist Volodymyr Kuznetsov. We are in the process of translating and laying out writing, artwork, and statements from the radical left wing of Ukrainian and Russian cultural workers in response to the events of “the Maidan” and the political theater surrounding the invasion of Crimea. The publication will be in broadsheet or newspaper format, double facing, in both English and Russian translation, intended to be distributed at little or no cost. Serhiy Zhadan, Ukrainian poet and anarchist, beaten for his organization and support of the occupation in the Eastern city of Kharkiv. Larissa Babij, translator, writer and curator living in Kiev. She has worked with fellow contributors, the performance group TanzLaboratorium, and is a member of the Art Workers’ Self-Defense Initiative. TanzLaboratorium, a Ukrainian independent performance group that works with time in given, randomly found, or consciously chosen spaces. Larisa Venediktova, a performer, dancer, director, and curator currently working with the group TanzLaboratorium. 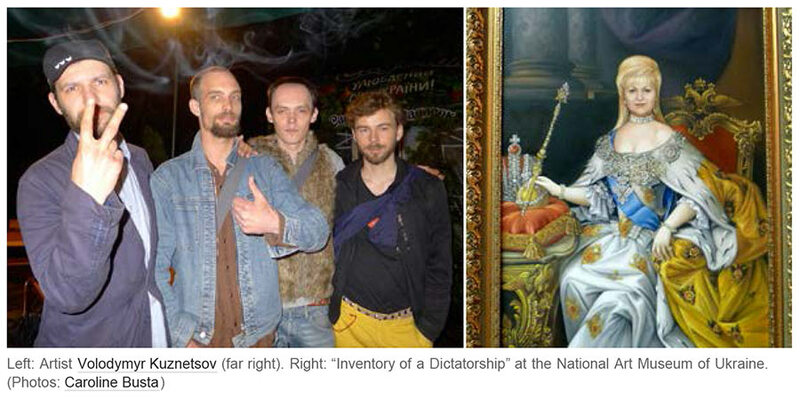 Alexandr Volodarskii, who was previously sent to a labor camp as retribution for a public “obscene” performance protesting Ukrainian censorship laws. He has just released a book in Russian about his time there with a violent humor. Mariana Matveichuk, participant of Maidan, coordinator of the School for Visual Communication and staff member of the Les’ Kurbas Center. Nikita Kadan, artist and member of REP, Hudrada, and the Art Workers’ Self-Defense Initiative. Anna Zvyagintseva, artist and member of Hudrada and the Art Workers’ Self-Defense Initiative. Volodymyr Kuznetsov, Ukrainian artist and member of REP, who was recently censored at the nationalist tinged “Great and Grand” exhibition at the Kiev Arsenale. The Autonomous Workers Union of Kiev, an anarchist organization that has released numerous statements on the uprising and ensuing crisis. Oleksandr (Sasha) Burlaka, architect, photographer, and member of Hudrada, who took an incredible amount of striking images during the period of unrest in Kiev. Pavel Arsenev, Russian poet, and editor of the magazine Translit. The Assembly for Culture in Ukraine, (also translated as Assembly for Art Workers in Ukraine or Assembly of Cultural Workers) who have released a call for art workers internationally to boycott art world events supported and hosted by the Russian state. Petr Pavlensky, Russian performance artist who recently was arrested for “petty hooliganism” with other artists and activists after a public performance of solidarity with the uprising in Maidan on the eve of Russian intervention. 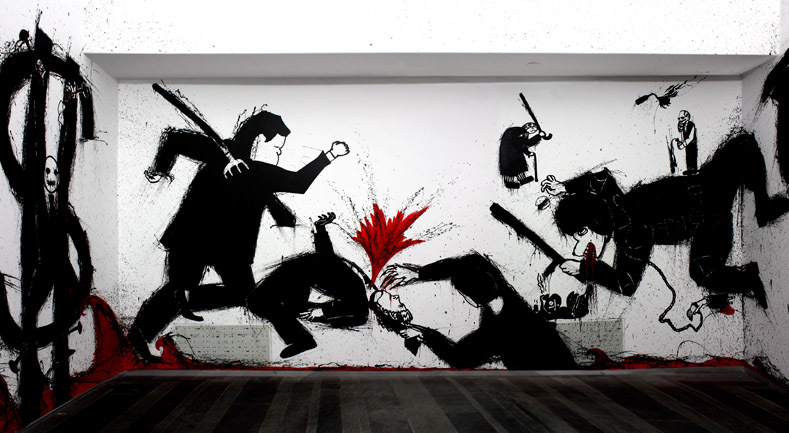 Chto Delat, a Russian collective of artists, writers, critics, and philosophers founded in 2003 with the goal of merging political theory, art, and activism. 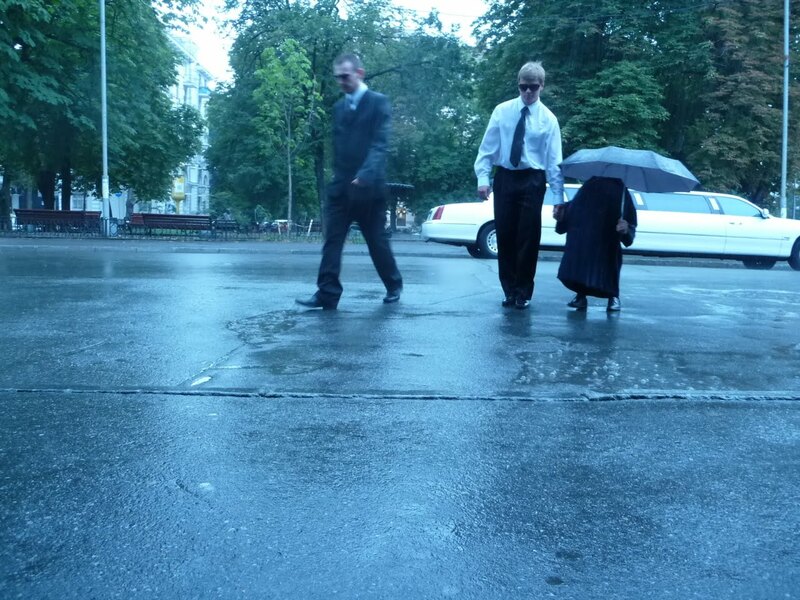 They have recently released a statement withdrawing from, and advocating the boycott of, Manifesta 10 in Saint Petersburg. Marina Simakova, a writer, critic, and a connoisseur of the twentieth-century literature. Lives in Moscow. David Chickan, an artist and a member of the anarchist Autonomous Workers Union. Lives and works in Kiev. Ian Dreiblatt, Ronald Meyer, Ilya Kliger, Olivia Crough, Dennis Ossipov-Grodsky, and J. Kates. Expect to see this inky propaganda go into print within a months’ time. We are pleased to offer another publication of sorts, this in the vein of an artists’ multiple or interwoven edition. 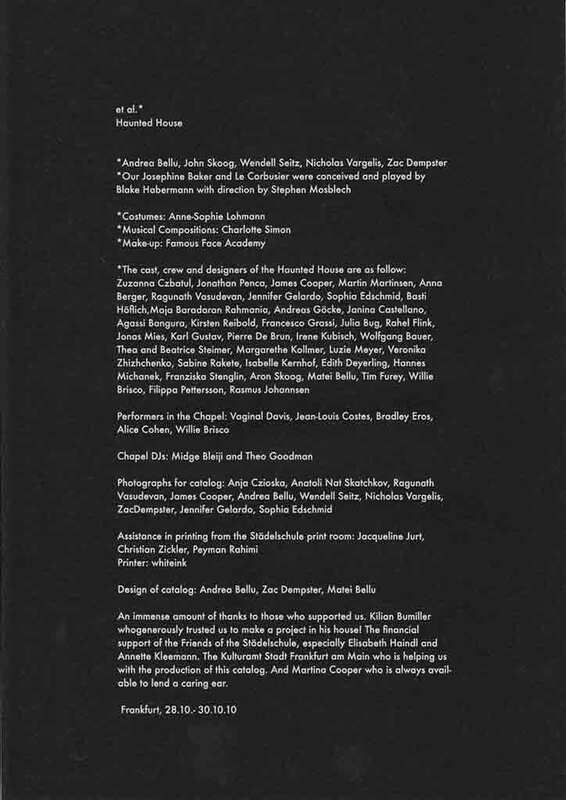 The book is a large collection of 8.5″ x 11″ prints, extrapolated from the Haunted House installation the artists’ group (and Gallows’ contributors) et al. erected in Frankfurt, Germany. 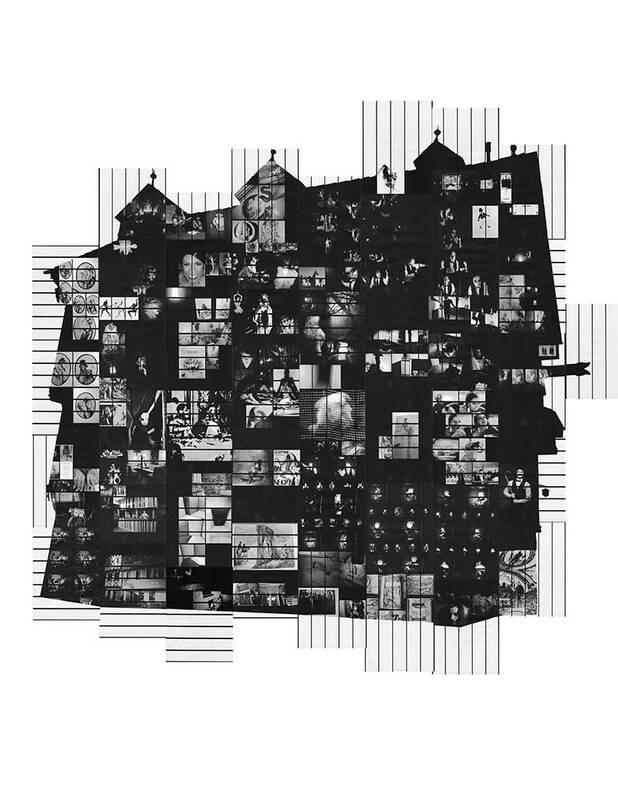 Each is a densely collaged fragment in and of its own right, but the totality of the book is intended to be re-assembled, together, to make a massive singular print. A diagram of the prints, fully assembled. “On three nights, from the 28th to the 30th of October, the artists’ group et al. * presented the Haunted House in Frankfurt am Main. There were a little over 60 artists and crew involved. The range of skill went from lighting design to costume design to make-up and carpentry. Eighteen artists performing in 20 rooms that guests to the house walked through. 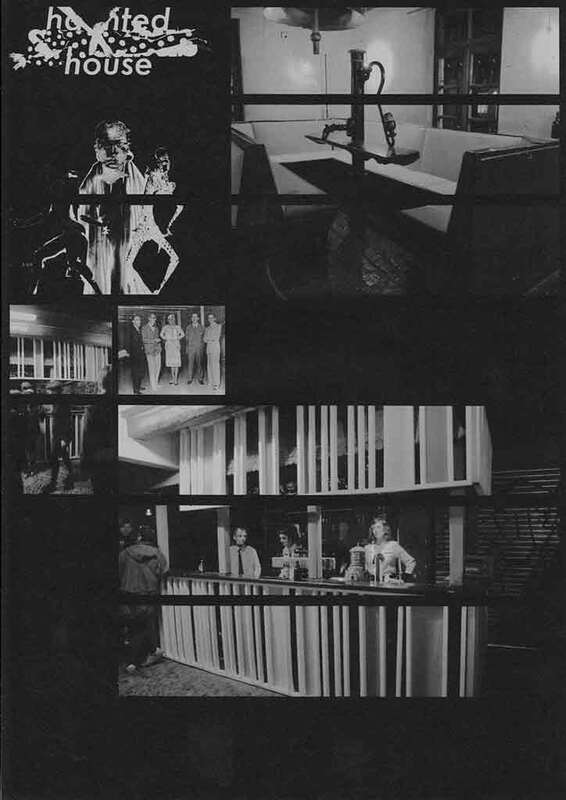 Additionally each night there were invited performers: Vaginal Davis (Berlin), Jean-Louis Costes(Paris), Bradley Eros(New York) who performed on a constructed stage in the “chapel” of the house. They would mark the opening of the evening and were themed accordingly. We will be participating in the Book Fair attached to the ACLA (American Comparative Literature Association) academic conference. It will be taking place at NYU building 19 University Place (ground floor) in Manhattan, March 22nd, Saturday, 11 A.M. to 5 P.M., just preceding an open to the public punk literary panel featuring the likes of Richard Hell and Kathleen Hanna. 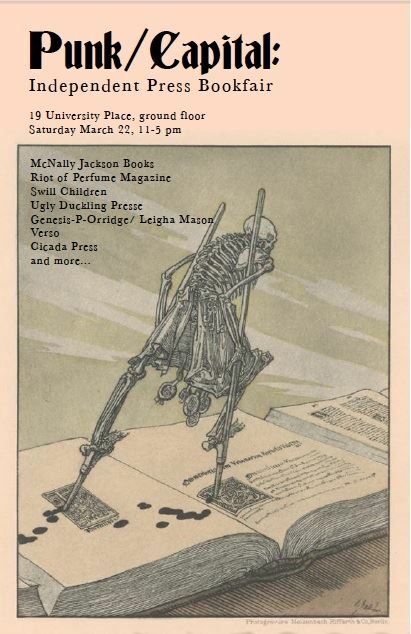 The book fair is intended to promote small presses, independent presses, and independent book stores, including friends: Swill Children, Ugly Duckling Presse, Verso, McNally Jackson Books, Riot of Perfume, Genesis Breyer P-Orridge, and Leigha Mason.